AsianBabeCams.com - Exotic models at your fingertips! How are the models of AsianBabeCams? 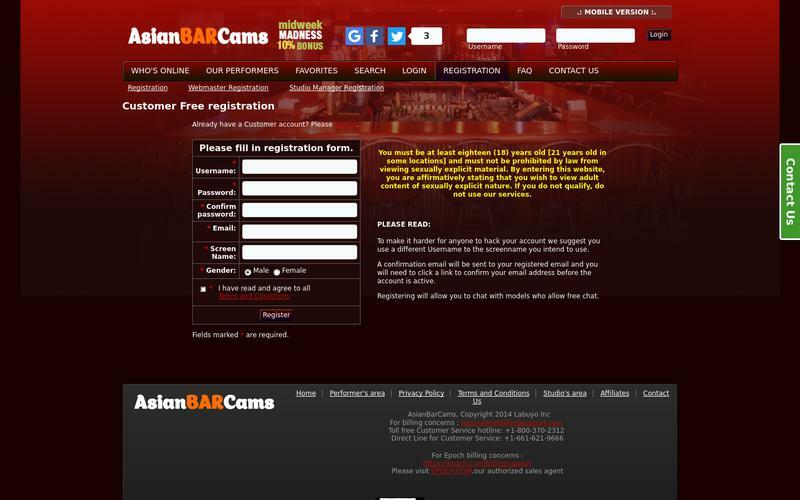 The models of AsianBabeCams.com are superhot and they want to get to know you and provide a service that will satisfy your needs and build upon a friendly relationship! A little further down, but still across the top of the page, you are given several options to choose from and even further down you can set your preference options with regards to what type of models you would like to see including ‘Transexuals’, ‘Pregnant Girls’ and ‘Virgins’! Every model sets their availability. Most will offer ‘Free Chat’, but others will be occupied and in a ‘Private Session’. There are no ads or annoying distractions when you enter the live cam and the page is strictly so that the focus is on that room with the model of your choice. The screen is split in two, so that the show is to the left and the chatroom is to the right. Across the bottom is the text bar and the options for sound or to widen the screen. You can view what the topic of conversation is within the room, but until you have created an account you may not be able to comment your opinion or become involved in the chat. This is because models prefer to leave guest chat turned off as to avoid interacting with time wasters and potentially rude browsers searching for freebies. 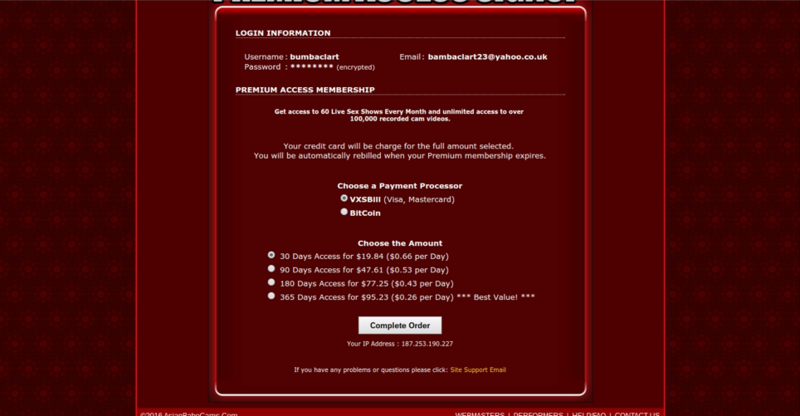 You will find that most of the time you will be prompted to become a member while exploring the site as a guest. Once you are registered, you may join in on the chit chat and add yourself some credit as to pay for a private session which is usually only around 0.99 per minute (depending on the model). You will also be able to purchase videos or send tips to your favorite models. Underneath the camera screen, at the bottom of the page, you will see the other models who are currently available and broadcasting, should you wish to switch and see what else is in store! If a member happens to be ‘In Private’, you can still click to see their profile and bio. Here you can read a little about what the appearance of the amateur is like and what he or she is into. If you are a member you will also be able to view the model’s free photo gallery. Becoming a registered user is easy! To ensure that you can access all areas and explore all of the features which are available on the site (at least until you are required to pay for a service), simply create an account! There are several prompts dotted on every page which will direct you to where you must fill in a ‘Username’ and a ‘Password’, as to login, but if you do not have one - click to the right hand side of the box where the text states ‘Sign up now”! Once you enter the screen to create a membership and have read the benefits of becoming a registered user, you will be asked to ‘Choose Username’, ‘Choose Password’, and supply ‘Email Address’, The last thing that is requested is to ensure that you are ‘not a robot’. Upon successful completion of registry, you will be redirected to your new home screen where you can see the new features and options are now revealed. If you enter your cam of choice now, however, you may find that your favorite model may have disabled ‘Free Chat’ for free members and request that they only speak to VIP members. When you take a look into the advantages of becoming a VIP member - including being able to repeat anything that you have missed with regards to live feature shows as well as access to other recordings - it is hard to resist! 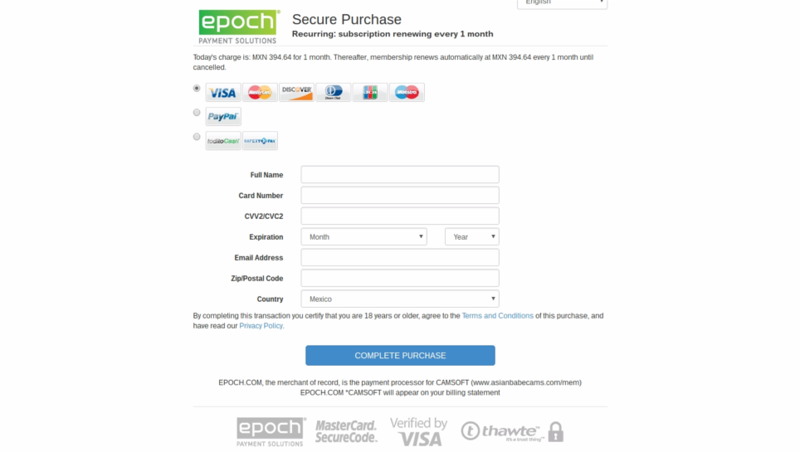 Scrolling down, if you are not interested in paying a monthly subscription, you will be able to choose the preferred length of time / days that you wish to make this a purchase and make the order. 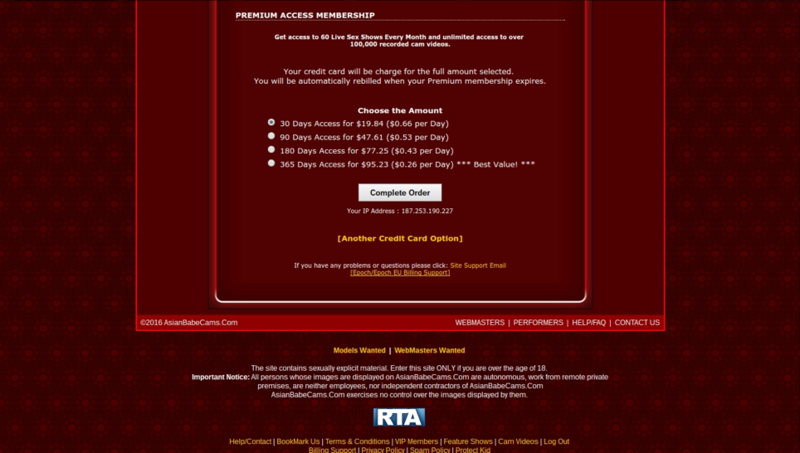 You can pay the annual fee to have the lowest price of just $0.26 per day! There are several payment methods that you are offered to use and these, (other than a standard card payment), involve PayPal. You will be taken to the ‘Secure Purchase’ page after the decision has been made as to which payment structure and method you would like to use. Here is where you will complete the transaction. 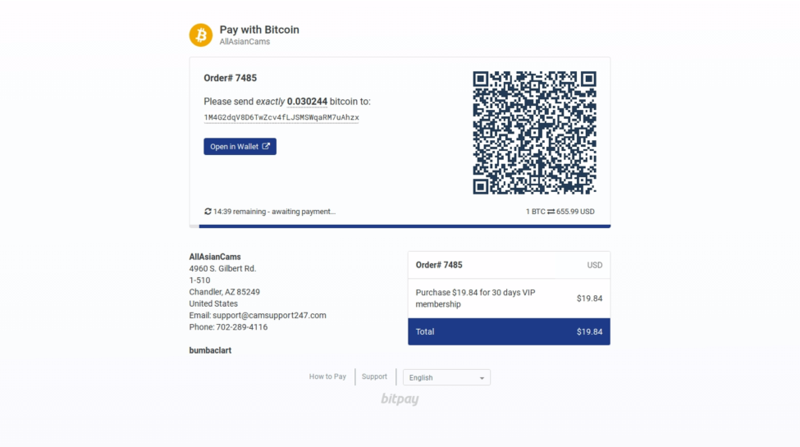 Otherwise, if you choose the option that reads ‘Another Credit Card Option’, you will have the opportunity to pay via Visa or Bitcoin which will take you to a different invoice page related to the nature of your choice. For those who wish to buy credit as to spend how and when they please, there are many offers to choose from also! Most of which will offer you a 10% bonus on whatever you spend! Overall, if you want to enjoy the luxuries that this particular site has to offer, you are better off giving yourself the VIP treatment and signing up properly. Show your respect and seriousness and receive the same in return!